A: We are based near Henley-On-Thames and we teach in and around the surrounding areas. We are happy to come to your house or for you to come to us. Q: What Syllabus do you cover? A: We structure our introductory lessons around the John Thompson Piano books, and then to develop on pieces that the student would like to learn, alongside skills pieces. Q: How Much Practice should I do? A: This depends on how fast you want to progress. The more often you practice, the quicker your progress will be and the better you will become. We recommend practicing every day for as little as 10 minutes if that is all you have time for. It is much better to do lots of short practice sessions than to practice for hours at a time just once a week. It takes time to build up the strength and muscles in your fingers so this can limit progress. It is important to cover what is taught in the lessons as they are aimed at helping you with your coordination and control, it is important to practice over and over. Q: Where do the Private Lessons Take Place? A: The lessons take place either in your own home or in ours, depending on available timings and suitability. A: You will learn to read music as we go along and with our style of positive encouragement and amazing musical resources to help you, you will be able to translate musical notes on paper to the keys on the keyboard in no time. Q: Do you teach complete beginners? A: Yes! Absolutely. We have taught many beginners of all ages. Even if you have never touched a piano before, we will have you feeling at ease sat at a keyboard and able to find your way around in no time. A: Lots of our students are children and we are happy to teach all ages. Half an hour lessons are best for young children as their attention span doesn’t usually stretch to a full hour. Q: Do I need a Piano before I start? 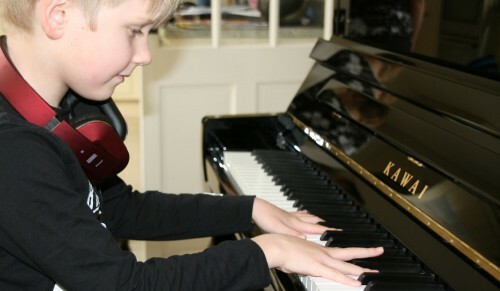 A: Ideally you do need a piano or keyboard to practice in between lessons if you want to progress. In the beginning a basic keyboard will do, but if you want to take things further and progress then we are able to recommend a range of digital or acoustic pianos. Q: How much do individual Lessons Cost? A: Our Standard Tariff for a 30 minute lesson is £18, however we do offer discounts for Siblings, do Contact us for more details.